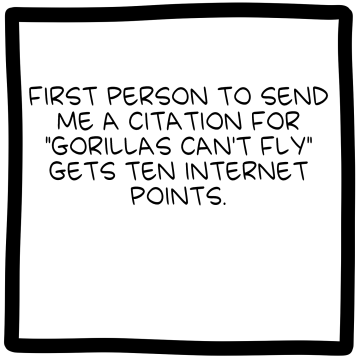 But gorillas can fly if you can convince the airline that it's an emotional support animal. I admit my answer would have been cleverer if I could use one of the papers comparing human and gorilla testes weight. There seems to be a large scientific literature on the subject. If I win the 10 internet points, I will donate them to the person who can find a citation showing: "avocados can't talk"
It strikes me that most of the prompts in this game would be negatives: planets are not safe for human consumption, lego minifigs are not good pack animals, etc. I'm really struggling to think of an example that isn't counterfactual. CCsF_S wrote: It strikes me that most of the prompts in this game would be negatives: planets are not safe for human consumption, lego minifigs are not good pack animals, etc. Try: some paintings are blue. It might not be that hard, I haven't checked. We need a science olympics for this sort of thing. Other tasks - who can fill out paperwork fastest? Who can p-hack best? It didn't take long to find this, either: "Birds and bats are the only extant vertebrate taxa that have achieved flight." Tracy Hall wrote: It didn't take long to find this, either: "Birds and bats are the only extant vertebrate taxa that have achieved flight." Are you making the assumption that gorillas belong to an extant vertebrate taxa? Citation needed. Peeling a banana is significantly easier than peeling an apple (citation needed). An ethogram of observed Gorilla behavior. Does not include flying. 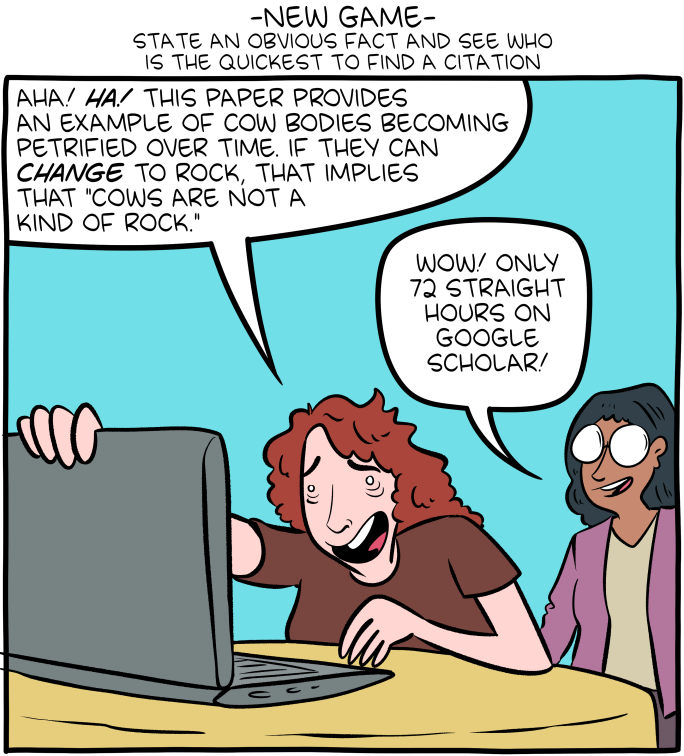 Unless you include a reference to flight or fight responses. SMOS wrote: An ethogram of observed Gorilla behavior. Does not include flying. Unless you include a reference to flight or fight responses. "...gorillas are regarded as specialized terrestrial folivores..."
There is a precise combination of pitch, tone, and cadence in a person's voice that creates audible cues in speech and allows them to be understood by the listener. It seems obvious enough, but I've had a professor hit me with a  on this. I'm still upset that I had to find proof that "people have recognizable voices." Capable Runt wrote: There is a precise combination of pitch, tone, and cadence in a person's voice that creates audible cues in speech and allows them to be understood by the listener.